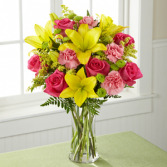 DESIGN COUNCIL EXCLUSIVE Floral Designer Phil DeVito of 1-800-Flowers, Carle Place says about his truly original design: “I set out to find a way to send the warm and welcoming beauty of spring to someone special.” Hot pink mini carnations and Matsumoto asters, yellow snapdragons, and more are hand-arranged inside our charming bird's nest basket, then topped with a playful springtime butterfly pick to send their heart aflutter. 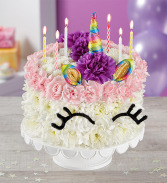 1-800-Flowers EXCLUSIVE From its twirly rainbow horn to its sweet eyelashes and mane, our unicorn flower cake is nothing short of magical! The latest from our truly original collection, this whimsical creation is crafted from a mix of white, pink and lavender blooms. 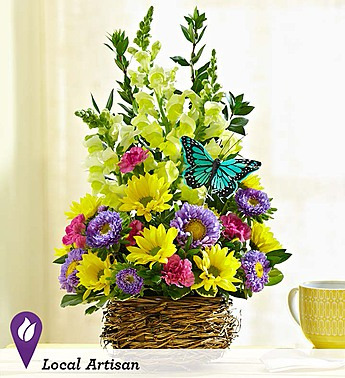 Sitting pretty on a pedestal stand, it’s a whimsical gift that’ll make all their birthday wishes come true—no matter what year they’re celebrating.